Contributions are invited for the 1992 issue. They may be on any subject relating to George Eliot's work, life, family or friends. They should be up to 1500 words in length and it is preferred that footnotes are used only sparingly. Contributions must be typed (double spacing) and should reach the Editors not later than February 28th 1992. Editor's address for 1992 issue: Dr. Graham Handley, Glasgow Stud Farmhouse, Crews Hill, Enfield, Middlesex. 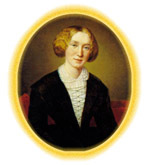 The George Eliot Fellowship gratefully acknowledges generous sponsorship of the Review from the English Department of the University of Warwick. NUNEATON MUSEUM AND ART GALLERY, Riversley Park, Nuneaton has been closed for some time for extension and refurbishment. On April 26th, under the Curatorship of Gina Quant, it was opened by the Mayor of Nuneaton and Bedworth Councillor M. Jones. On the ground floor the George Eliot Room is based on her drawing room at the Priory in London (circa 1870) and contains models of George Eliot, G.H. Lewes and John Cross. There is a new local history gallery and galleries devoted to exhibitions as well as a lecture theatre. For the comfort and convenience of visitors, there are now toilets, a lift and a tearoom.